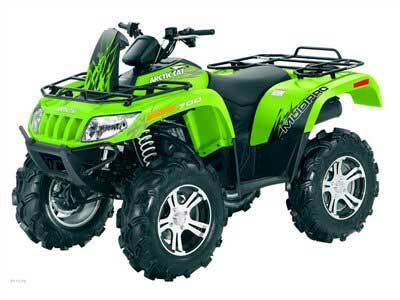 Arctic Cat Mud Pro Model Overview. Arctic Cat Mud Pro Overview. Arctic Cat Mud Pro models for 2012 consist of three models with two different engine sizes. We'll get into the details a little later, but Arctic Cat will offer two versions of the Mud Pro with the 700 engine, and a top of the line model with the V-twin 1000 engine. Anyone interested in ATV mudding should be covered. The base model 700 will appeal to riders looking for a high value way to get involved in the fun. Arctic Cat MudPro 700 LTD has everything you need for ATV mudding! The "tweener" model still has the 700 engine like the original, but is also loaded with extras like a winch, bumpers, and electric power steering. Top of the line model gets all that plus a longer wheelbase and the big V-twin 1000 engine. Arctic Cat Mud Pro Models and Features. Mud Pro 700i - Base model offers a lot of value for aspiring ATV mud riders. It has all the important features of the Mud Pro models but without the bumpers, winch, and electric power steering. You do still get the 28" Maxxis Zilla tires on aluminum wheels. Priced almost $3,000 less than the original Mud Pro, the new 700i puts the sport of ATV mudding within reach of even more riders. If you don't plan on doing much trail riding, the winch and bumpers wouldn't be missed, so why pay for them if you don't need 'em? Everything else you need in a mud ATV is already there in this factory built special. The only exception to that would be for those riders that really want to go deep. Some owners have reported problems with radiator clogging and fan malfunctions when riding in deeper mud and water. The stock radiator and fan would be less prone to problems if they were relocated to the front rack. Several aftermarket kits are available at reasonable prices, so that's not really much of a problem. Mud Pro 700i LTD - The LTD comes with a winch, front and rear bumpers, and the new electric power steering. It still offers a great value in a ready to go mud ATV, just at a higher level than the base model. The LTD version is what we would call a more well rounded mud ATV. The addition of the winch, bumpers, and electric power steering, improves the trail worthiness and capacity for work of the Mud Pro 700. You don't lose any of the mud ATV ability, and you gain a good bit of trail and work capability. If most of your riding is tight trails with a lot of mud, this LTD would be a great choice. The low gearing and high ground clearance, along with the power steering, make it a natural for those knarly trails you might not want to tackle on something else. When it comes to work, the low gearing, 2" receiver hitch, front and rear racks, and stump pulling torque, can handle almost any chore you can think of. We know several owners that love to use their Mud Pros for snow plowing. So when it comes to mudding four wheelers, this Arctic Cat Mud Pro will hang right with any of them, but that extra $900 for the LTD buys a lot of ability to do more than just ATV mudding. 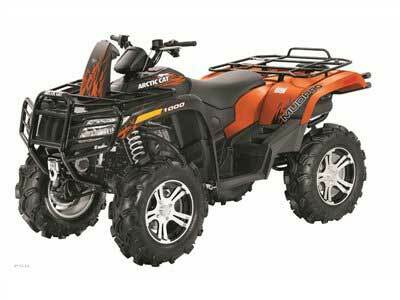 Mud Pro1000i LTD - Arctic Cat only offers the 1000 as a decked out LTD model. It's based on the same chassis as the two up 1000 Thundercat. You get all the features of the original Mud Pro, plus all the LTD equipment, and the biggest plus - the V-twin 1000 engine! If you're serious about dunking your ATV in mud holes, it doesn't get any more serious than this Mud Pro model! Funny thing is that with the longer wheelbase, power steering, and extra power, it's really a pretty good all around 4x4 ATV. Of course, at that price, it probably needs to be. Dedicated members of the Muddy 4 Wheelers club might prefer a rack mounted radiator and more aggressive ATV mud tires, but everyone else should be more than happy with the biggest Mud Pro. It may not be as ready for ATV mudding competition off the showroom floor as the Can Am Outlander 800R MR, but it's not far off. Even though the Arctic Cat Mud Pro 1000 is priced a little higher, we think it offers a much broader range of use than the more narrowly focused Can Am. You could chase alligators in a Louisiana swamp one day, and play with mountain goats in the Colorado Rockies the next. The 14 inch ground clearance, the stability of the longer wheel base, and the big power of the V-twin engine makes it all possible. So even though Arctic Cat set out to create a mud ATV, they may have come up with an even better extreme terrain ATV! If you look at it that way, it just might justify that extreme price. Arctic Cat Mud Pro specifications for all models.